Tonight, the Discovery channel had an interesting “Mega-Builders” segment. You can also watch the segment on their web video. Houston is in peril. The country’s fourth most populous city faces heat, hurricanes, and other natural disasters. Only a radical engineering solution will save the city: a massive dome, 1,500 feet high and a mile in diameter, would protect the city. Despite understandable initial skepticism, the idea has some merit. Building on Buckminster Fuller’s established concepts for the geodesic dome, Discovery advances the idea that a dome over the financial district of Houston could save billions of dollars in hurricane damage, create climate control, minimize the extremes of Gulf weather and humidity, reduce heating and air conditioning costs, and generally reduce the stress of downtown existence. The technology is not all there, but it’s close. The design is well understood and has been done on large (but much smaller) scales, and the materials are available and proven. Construction, of course, would be a massive undertaking and some elements would have to be worked out, such as monster helium lifting dirigibles. While it seems likely such advanced, lightweight designs could eliminate fears of creating a new class of catastrophe, and actually survive any hurricane Nature could throw at it, I had the inevitable questions about all the petty little “how-to” details. What would maintenance be like, and life itself, under such a dome? No rain: nobody likes rain in the Big City. But rain cleans the streets. Where would they divert all that rain, and would they store it? Lightning strikes: would the geodesic frame shunt away all that current without structural damage? Smog: nobody likes smog either. For better or for worse, in an open city, at least it blows away. Despite aggressive current efforts to begin tackling this global problem, would the air-current ventilation system be up to venting away pollutant build-ups? Could people drive into this city? Climate control: the show demonstrated how internal convection currents would occur naturally and could be used to control inflow of cooler air, and, to some extent, humidity. Could there be a “thermal runaway point” at which this greenhouse could soar dangerously? Fire and toxic disasters: Eventually there is always a high-rise fire, multi-vehicle crash, or electrical substation explosion that releases profuse quantities of hazardous fumes and smoke. How do you demonstrate that such a structure can quickly circulate this out of the system? Manufactured “weather”: it’s a well-know engineering fact that very large open-space structures, such as aircraft and dirigible hangars, can generate their own micro-climate weather, and even rain. While this could be fun, is it planned for? Repair and disassembly: if something went seriously wrong, could men and materials be delivered safely, 1,500 feet high, for repair? If planners decided on a “backout”, could it be disassembled as easily as it was erected? Police and rescue helicopters: would these still be safe inside the dome with a 1500′ ceiling? Probably not. Sabotage and terrorism: The inside confines of a dome pose obvious threats for airborne toxins. Would this require a whole new layer of Homeland Security, or could the dome be engineered for emergency venting? Power failures: the dome is completely self-supporting, not inflatable. What other impact could loss of the city electrical grid pose inside the dome? Aesthetic and environmental: it’s likely many people will object to one or more aspects of life in a dome. Modern life is artificial enough. There will be a breeze, but no winds, and little variability. Wait, do we want pigeons? Conclusions: There are already many large, successful geodesic domes; the Wikipedia article also lists the ten largest. The world’s largest greenhouse domes, in the UK, are cited by the Discovery segment but are not listed in the top ten. They also proved very successful but are designed to replicate tropical and subtropical growing conditions, not to house permanent human habitats. 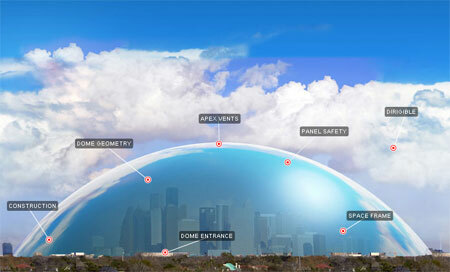 It seems unlikely that the first city-sized dome will be built to shelter a major metropolitan area and business center such as Houston; however, the technology, though unproven on this scale, has promise. If undertaken, such a project will probably start with part of a small or medium-size town, or possibly a small new habitat will be built inside from scratch, and especially designed for, life under the dome. This entry was posted in Science and tagged Engineering by Alex. Bookmark the permalink. It would cost more to have domes on all the big cities in the world than try to avoid climate change. Agree! In more ways than one! Gad, come to think of it, if ocean levels rise 100 feet or more as they have done in the geological past, are these domes going to be submersible? Due to the hot climate and seasonal monsoon rain, I have always imagined that it would be great if we can build a giant dome over this island and control the climate and temperature on our island. It somehow looked like an impossible dream until I saw this Houston Dome program on Discovery Channel recently and checked out this website. To cover the whole island of Singapore may be a mammoth task, however we have a tourist attraction on this place called “SENTOSA ISLAND”. On this island are several nice beaches, resort hotels, golf course, a casino and a Universal Studio Complex. It attracts lots of tourist from this region and brings in good tourist revenue. Would imagine that it may be a wonderful idea if we can build a huge dome over this island and provide an all weather tourist attraction for its use. Besides that, if the ambient temperature can be controlled in such a way that it is nice and cool for the tourist, it would certainly be a big sell. With your reputation, you may be able to sell this idea to the Management of Sentosa Island. They are known as SENTOSA DEVELOPMENT CORPORATION. It would be greaat if this idea comes true………….. Best regards. Thanks for your post from Singapore! I spent a pleasurable hour trying to learn about Sentosa. To this Californian, it looks like a plush resort attraction in a tropical paradise: beaches, lush tropical vegetation and lots of it in all sizes, and gardens. Wikipedia also shows a photo of what looks like loading cranes, so there’s probably a seaport as well. If the “dome technology” ever arrives, I assume its circumference could of course not enclose beaches, seashore or seaports. And what of rich natural vegetation that depends on a steady supply of rainfall from seasonal storms or monsoons? In Sentosa, it looks like nature is thoroughly integrated into the man-made environment! Who is going to water all that? What about migratory birds? I imagine naturalists and ecologists have a fit when they contemplate such challenges. Here a much more modest dome might be an attraction, perhaps favoring just a few inland hotels (not the beach resorts). If we artificially water hundreds acres of lawns, forest, yards and grounds (whether by sprinkler or drip irrigation), how will the system dispose of so many tons of atmospheric humidity? Quite honestly I originally fancied the dome idea for “super-hostile” climates like Dubai. But we’re so far away from the developed technology, or even “proof of concept,” that I doubt most of these practical and ecological considerations have even been addressed yet.